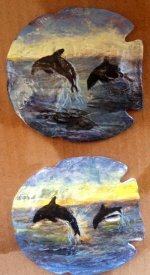 These are each a unique one of a kind handpainted Coastal Ornament. When you buy it it is forever gone. Admit it, everyone likes having things that no one else can have! !